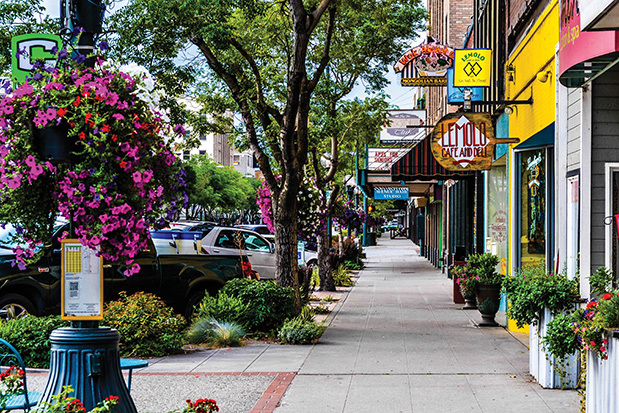 It’s springtime in Wenatchee, and this small city of 32,000 has much to offer a weekend explorer, especially one ready to cast off the gray shroud of a rainy Seattle winter and step into sunshine (200 days a year!). The mighty Columbia and Wenatchee rivers meet here and orchards and vineyards march up steep hills before giving way to the arid sagebrush of higher elevations. Explore the small but intact downtown, eat well at the acclaimed Pybus Public Market, take to the hills in search of wineries and bike or walk along the Columbia River. You could come just for the day (Wenatchee is only a two-and-a-half-hour drive from Seattle), but there’s enough here to occupy you for a weekend or longer. Explore: On a Saturday morning, head straight to the Pybus Public Market, which since opening in 2013 has become a community gathering place with frequent events, performances and a Saturday farmers’ market. The building—originally owned by pioneering businessman E.T. Pybus, who ran the Pybus Steel Company—houses restaurants, food-related businesses and a community kitchen that frequently offers cooking demonstrations. It’s easy to find a few things you’ll want to cart home (olive oil and balsamic vinegar from D’Olivo, a bottle of wine from Jones of Washington, pickled vegetables or salsa from Almond Blossom). When you’ve filled your trunk, make your last market stop Arlberg Sports to rent a bike to take on the 11-mile, paved Apple Capital Loop Trail, just outside the market. It runs on both sides of the Columbia River, crossing at the north and south ends of the city. Taste: While there are fewer wineries around Wenatchee than, say, Walla Walla, consider this a happy circumstance. No need to try to cram in a visit to 12 spots in one day. Head into the hills above town for a visit to the Malaga Springs Winery. The drive, partly down a gravel road, takes you through spectacular orchards and has a reward at the end: winemaker Al Mathews, an easygoing host who gives generously of his time and stories as he pours his award-winning wines. On the other side of the river, gregarious winemaker Mike Scott is likely to welcome you to his Martin Scott tasting room, which offers spectacular views of the Columbia River and a patio on which to enjoy them. Before leaving the area, buzz by the Wenatchee airport en route to Snowdrift Cider Co. Orchardist and cider maker Peter Ringsrud will tell you he tried making cider for years with disappointing results. That changed after he met U.K. master cider maker Peter Mitchell—and learned he was using the wrong variety of apples. In 2009, Snowdrift became one of the state’s first commercial cideries. It’s been turning out a variety of artisan ciders ever since. Eat: Located just off Highway 2 beyond Cashmere, and not near anything else, is Anjou Bakery. Stop for coffee and a flaky almond cream croissant or a rustic fruit Danish before continuing into town. If you’re not sure what you’re in the mood for at lunch or dinner, Pybus Market offers choices that include Fire (wood-oven pizza), South (Latin food and drink) and the Pybus Bistro, with a menu that wouldn’t be out of place in Paris. If you’re in town at lunch, the eclectic Lemolo Café & Deli is a local gathering spot. Searching for fine dining? Taste some wine before settling in for dinner at the Chateau Faire le Pont Winery. Half of the building, a 1920s renovated brick warehouse, is a tasting room; the other half, a restaurant, where wild mushroom crusted New Zealand lamb or osso buco bourguignon is a delicious way to end the day. Don’t miss In April, it’s Apple Blossom Festival (appleblossom.org) in Wenatchee. This weeklong affair celebrates the fruit that was around long before vineyards began climbing up hillsides. This year’s festival is April 27–May 7. Drop by to celebrate with food, entertainment, a grand parade, sports tournaments, car rallies, an arts and crafts fair and even a pie-eating contest, which, we’re betting, will showcase the apple.